With the 2010 summer solstice having occurred in the northern hemisphere that means it is time for a quick out and about update. It has been a busy winter and spring in the office, on the road as well as at home. Some results of this recent activity have appeared in blog, on my web site as well as via other sites and venues. For example, activity or content ranges from Industry Trends and Perspectives white papers, reports, blogs, newsletter commentary, interviews, Internet TV, videos, web cast, pod casts (including several appearances on StorageMonkeys Infosmack as well as Rich Brambleys Virtumania), ask the expert (ATE) questions, twitter tweets, tips and columns. Then there were the many in person presentations, key note and seminar events, conferences, briefing sessions along with virtual conferencing and advisory consulting sessions (read and see more here). Regarding having new content appearing in different or new venues, Silicon Angle (including a video), Newstex and Enterprise Efficiencies join the long list of industry and vertical, traditional along with new world venues that my content as well as industry trends and perspective commentary appear in. Read more about events and activities here, content here or commentary here. 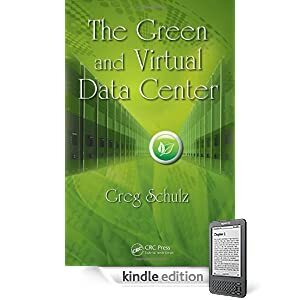 Speaking of books, there is also some news in that The Green and Virtual Data Center (CRC) is now available on Amazon Kindle (click on links below) as well as having been translated and published in China not to mention having undergone another round of printing keeping up with demand to make more copies available via global venues. As for what am I seeing and hearing, check out the new series of Industry Trends and Perspective (ITP) short blog posts that compliment other posts as well as content found on the main web site. These ITP pieces capture what I am hearing and seeing (that is of those what I can talk about that are not under NDA of course) while out and about. Some of the cities that I have been at while out and about doing keynote speaking and seminar events as well as for other meetings have included Minneapolis, Miami, San Diego, Beverly Hills, San Jose, San Diego (again), Hollywood (again), Austin, Miami (again), New York City, Reston, Minneapolis (again), Irvine, New York City (again), Boston, Toronto, Atlanta, Chicago, Columbus, Philadelphia, Mountain View, Mahtomedia (Minneapolis area), Boston (again) and Indianapolis, Calgary, Jasper (Alberta), Vancouver in Canada as well as Nijkerk (Netherlands) for a one day seminar covering Industry Trends and Perspectives in addition to changing planes in Atlanta, Detroit, Memphis and Las Vegas. The Planes should be obvious, however what about automobiles you ask? How about the following taken from my rental car while driving north of LAX on the 405 after a January storm during my trip from San Diego after a morning event to Beverly Hills to do an evening keynote. Another car trip a few weeks later after a different event in San Diego I had a driver from a service behind the wheel so that I could get some work done before an evening meeting. Also on the car front, after flying into Indianapolis there was a car ride to Indianapolis Motor Speedway (IMS) to do a keynote for a CDW sponsored event in gasoline alley a few days before the big race there. While we are on the topic of automobiles and technology, if you have not seen it, check out a post I did about what NAS, NASA and NASCAR have in common. What about trains you ask? Besides the normal airport trams or trains, there was a fun Amtrak Acela ride from New York City Penn station after a morning event in the city up to Boston so as to be in place for a morning event the next day. Other train activity besides airport, subway or commuter light rail in the US and Europe (Holland), there was also an overnight trip on VIA Rail Canada the Canadian from Jasper Alberta to Vancouver (some business tied into a long weekend). If you have never been to the Canadian Rockies, let alone traveled via train, check this one, it was a blast and I highly recommend it. It just dawned on me, what about any out and about via boats? Other than the Boston water taxi to Logan Airport from the convention center where EMCworld was held and that I did an Internet TV interview along with @Stu and @Scott_Lowe, boat activity has been so far relegated to relaxation. However, as all work and no play could make for a dull boy (or girl), I can update you that the out and about via boat fishing and sightseeing activity has been very good so far this fall even with high (then low, then high) water on the scenic St. Croix river way. Here are some scenes from out and about on the St. Croix river including an eagle in its nest tending to its young who can not be seen in this photo as well as fishing (and catching and releasing). In between travels (as well as during on planes, trains and in hotel rooms) as well as relaxation breaks, I have been also working on several other projects. Some of these can be seen on the news or tips and articles as well as video and pod cast pages in addition to custom research as well as advisory consulting services. I have also been working on some other projects some of which will become visible over the next weeks and months, others not for a longer period of time yet and yet others that fall under the NDA category so that is all I have to say about that. If you are not receiving or have seen them, the inaugural issue of the Server and StorageIO newsletter appeared in late February followed by the second edition (Spring 2010) this past week. Both can be found here and here as well as at www.storageio.com/newsletter or subscribing via [email protected]. A question I often get asked is what am I hearing or seeing particularly with regards to IT customers as well as with vars during my travels. Here are some photos covering some of the things that I have seen so far this year while out and about. Note all of the dell servers side by side under the screens required to drive the image. Whats on deck and and that I am working on? Having had a busy fun winter and spring Im going to get some relaxation time in during a couple of week period of no travel, however there is plenty to do and get ready for. The summer months will slow down a bit on the out and about travel events scene, however not to a complete stop. In between preparing for upcoming events, advisory and consulting activities as well as researching new material and topics not to mention working on some projects that you will see or hear more about in the weeks and months to come. For example I will be a guest on a webcast sponsored by Viridity discussing the importance of data center metrics, measurement and insight for effective management to enable energy efficient and effective data centers on July 8th. 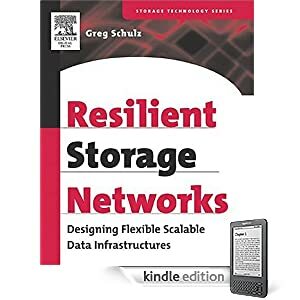 In addition, I will also be doing another five city storage virtualization series in Stamford, Cleveland, Miami, Tampa and Louisville during mid to late July among other upcoming activities including VMworld in San Francisco. Check out the events page for more details, specific dates and venues. What have you been doing or have planned for your summer? Let me know what you are seeing or hearing as well as have been doing. Have a place to backup and protect all those summer photos, videos and audio clips that you record while on your out and about adventure. However, keep in mind privacy concerns when uploading them to various social mediums. After all, what happens in Vegas stays in Vegas and what happens on the web stays on the web! Thanks to everyone involved in the recent events which can be seen here, as well for those who will be participating in upcoming ones I look forward to meeting and talking with you. Until next time have a fun, safe and relaxing summer if you are in the northern hemisphere and for those down under, not to worry, spring is on the way soon for you as well. Follow via Google Feedburner here or via email subscription here.